Do you remember being required to write an essay like this when school started in September? It was always a chore. The Pirate family and other (extended) family members always go tent camping. In years past, it has been a real crowd. However, as people age, have health issues, obtain jobs, have other obligations, move away (yes, Lisa and Catherine ... this means YOU! ), we have had fewer people being able to participate. This year, we had the lowest participation rate ever ... and it was very weird. The most people we had this summer was 8 ... which eventually reduced down to ... 3 ... by the end. THREE people! Inconceivable! The *only* advantage that I can see to having so few people is that the cooking options dramatically increase when you don't have 18 people to cook for, using only camp stoves or Dutch ovens! Otherwise ... man, was it quiet! On the other hand, not having children around meant that we (the parents) didn't have a lot of activities to organize or trips to do, so I had a LOT of time for myself to work on my hand needlework projects, fondly called my Forever Project ™. I've had many Forever Projects over the years. The main purpose of a Forever Project is for me to be productive when I'm not at home ... at doctor's appointments, Little League games, vacations. My Forever Projects are always hand needlework of some sort. I really don't care if they never get finished (one Forever Project .. a hand-stitched, twin sized Cathedral Window quilt took me 7 years. :-) ) but they always do. This means that I'm always on the lookout for a new Forever Project. with hexies. I was kinda intrigued by hexies but wasn't sure if I wanted to commit myself to a big project. It turned out that I really did enjoy the entire process .. cutting the templates & fabric, prepping the hexies and hand stitching them together. I still haven't made a complete, finished item from last summer's exploration, but *this* summer I *DID* (almost) finish a 86"x 98" hexie top! All the hexies have been sewn together .. and that was a MAJOR accomplishment! I had been working on those hexies for a year! 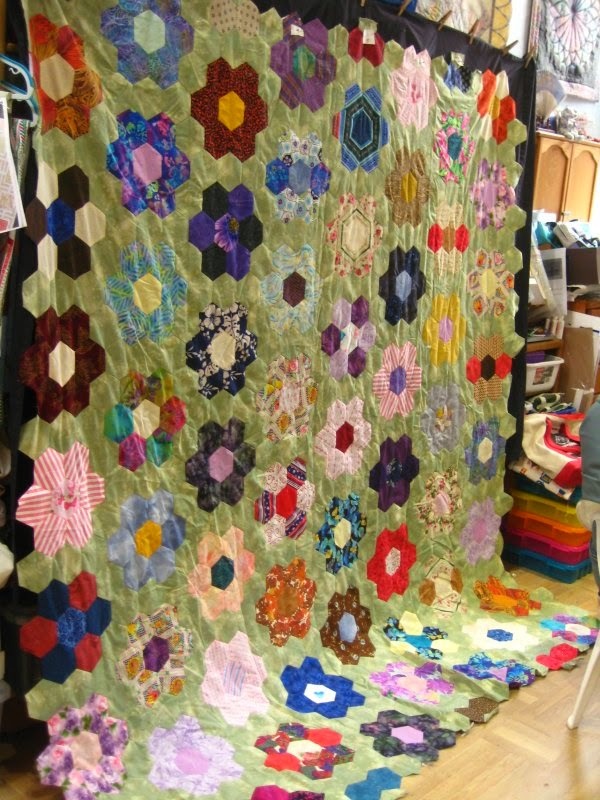 I did acknowledge that I was reluctant to work on the *small* hexies as so many quilters do. I wanted larger hexies, precisely so that I could cover a large amount of real estate in a relatively short amount of time. The hexies that I used for this project measure 2" along each side and 4" at the widest point-to-point. Eventually, a border will be sewn all around, so it will be larger, although I'm not entirely certain, at this point, exactly what the final measurements will be. Since the edges of this top are naturally jagged and I want to put borders on it, the next phase will be to straighten out the jagged edges just for that purpose. 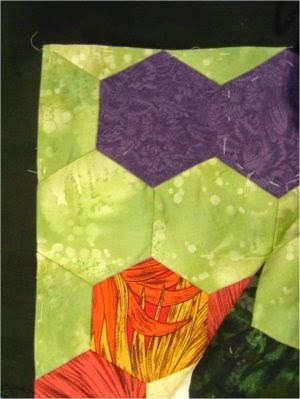 Here's a picture of one corner that I have added the partial hexies to, in order to straighten out the edges. not those ridiculous 1/4" ones!! !, but certainly much smaller than the top used! My smaller hexies measure 3/4" along the edge and 1-1/5" point-to-point. 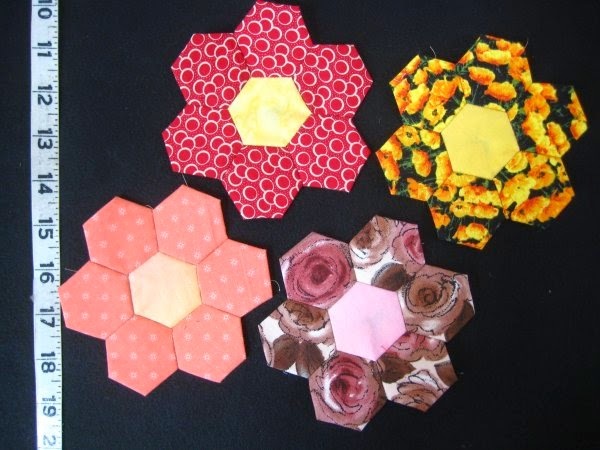 A note about the paper hexie templates that I used for the big hexie top and these small hexie flowers ... I have a multi-size hexagon acrylic template by EZ Quilting. It's very handy to be able to cut your own templates. I have a home business that generates scrap paper, which I put to use, among other things, by cutting templates. You might ask "Isn't that a waste of time and effort? There are pre-made plastic or paper templates that you can buy." And that's a good point, EXCEPT, that hexie quilt top? That one took a bazillion templates, since you need to leave the templates in place until a hexie is completely surrounded and supported by other hexies. I would have needed to take out a loan to buy that many! AND .. I have all that scrap paper *and* lots of time. Remember, this is a Forever Project, so technically, I have "forever" to get it done. What THAT meant is that I need to keep the two smaller hexie templates separate from each other; I can't use them in the same project. :-( How annoying. But .. onward and upwards, ya know? 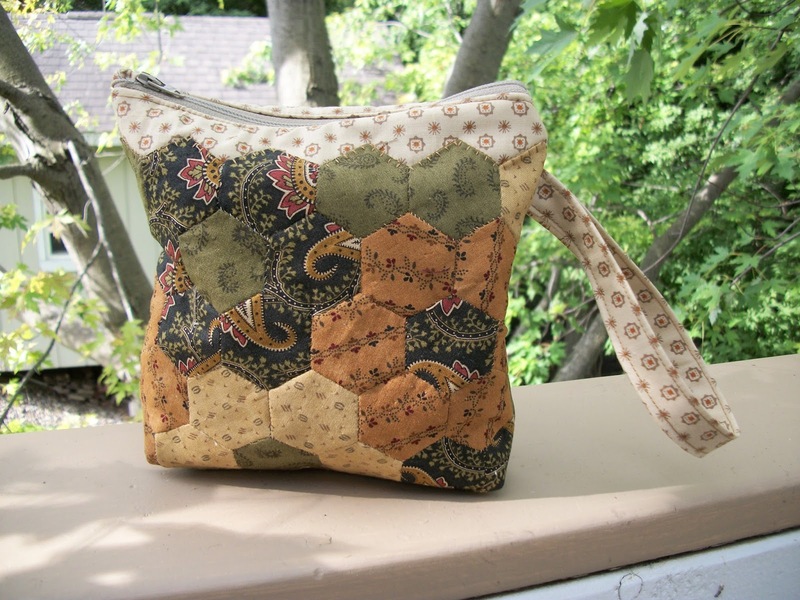 The final project is the zippered bag, as shown in the picture below (which is on the blog page). I found it at Quilt Doodle Designs. I may change the handle from a wrist thing to an over-the-shoulder one. Maybe. I gotta see how it looks once the back and the front are sewn together. I may also box the corners so it has a flat bottom. Maybe. I'll have to wait and see. And my final project I stitched up on my summer vacation is a hexie pincushion ... or, as I thought, perhaps maybe a soft baby toy? 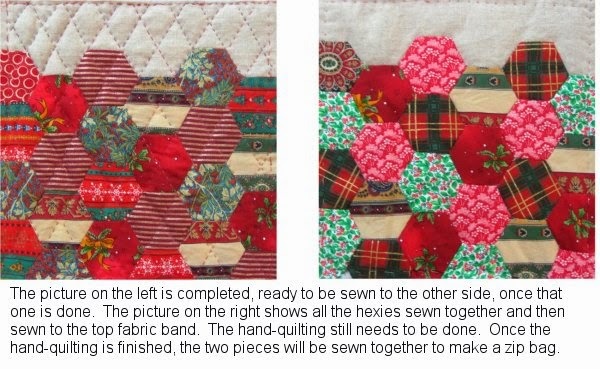 The directions can be found at Victoriana Quilt Designs.